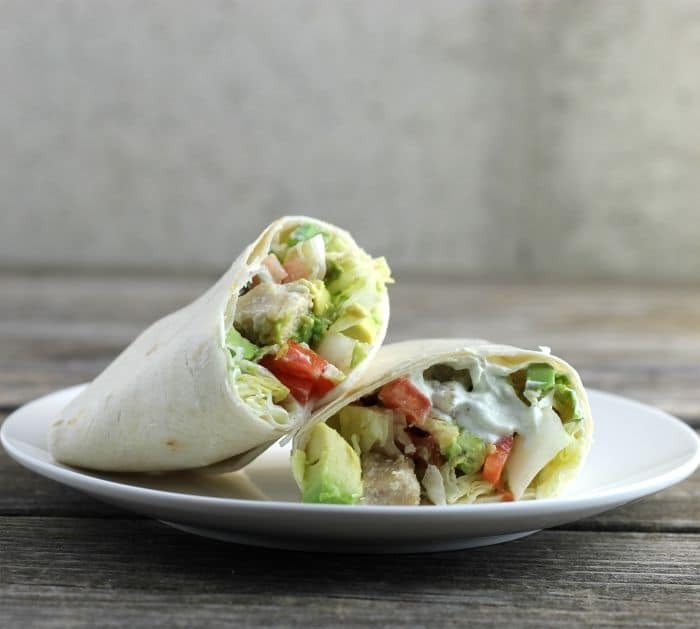 Chicken wrap with savory cream cheese spread a simple wrap with a ton of flavor. The savory cream cheese spread takes this simple chicken wrap to the next level. I pack my lunch for my day job 5 days a week. In the winter I love to eat soup and normally I make a large kettle of soup every weekend. But there are weekends that time just doesn’t allow the chopping and cooking it takes to make a large kettle of soup. So then I like something simple, usually, it is a sandwich and some veggies or a salad on the side. This week I decided to change things up with a chicken wrap, how fun. 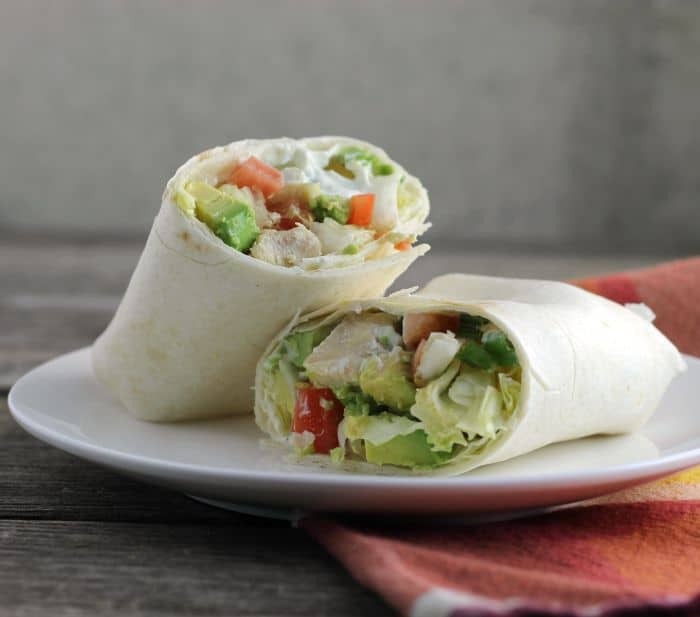 Chicken and veggies all rolled up in a tortilla shell for a delicious lunch. Believe me when I say that I can’t wait for lunch to roll around. Oh, by the way, did I mention that there is a savory spread that brings this wrap all together? Oh, yeah this spread changes everything. 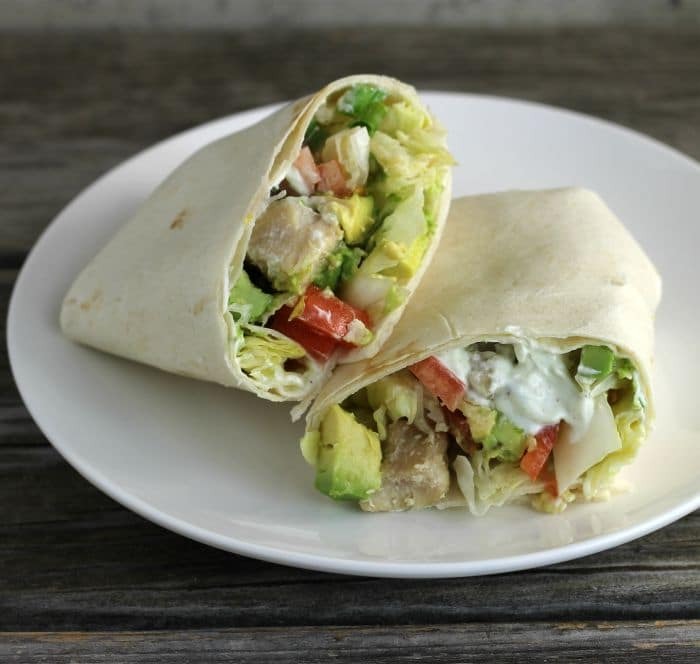 It is creamy and full of flavor and goes perfectly with all of the ingredients in the wrap. Totally delicious! The spread is made with cream cheese, sour cream, garlic, green onion, and celery salt. So simple to make and so delicious. 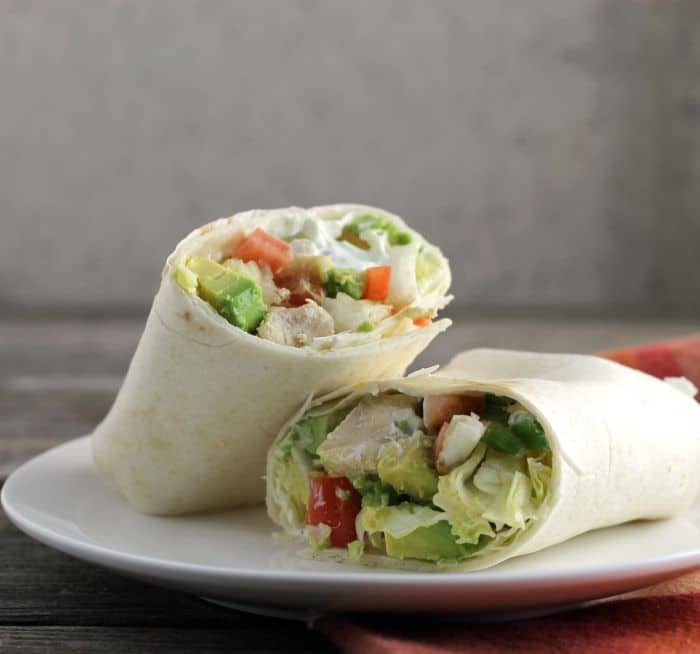 Looking for something different for your lunch try a chicken wrap with savory cream cheese spread. In a mini food processor add the green onions and garlic. Process until the green onion and garlic are finely chopped. Once the chicken and the veggies are cubed, diced, and shredded it is time to make the wrap. Spread about 2 tablespoons of the spread on each of the tortilla shells. Top with the chicken, tomato, avocado, green onion, and lettuces. Fold in the ends and roll up. Cut in half and serve. You can use rotisserie chicken or leftover chicken for this recipe. Wonderful and they make a perfect lunch! Wraps are so good, aren’t they? And fun to make and eat. This looks wonderful — full of enticing flavors. Thanks! Excellent chicken wrap, Dawn! This is a great lunch recipe. What kind of milk do you use for the cheese spread? Hi Agness, I used 2% milk in this recipe. It was used to thin the spread out a little bit, so I would think that you could use your favorite. Oh boy that does look good. I might have to eat before noon if I had one of those. I’d be looking forward to lunch too Dawn! I might even have one for breakfast! Love that tasty spread!